Struggling with finances is something that many businesses have dealt with throughout the company’s life, but sometimes debts pile up to the point where a company may have to file for bankruptcy. What this means is that filing for bankruptcy doesn’t necessarily have to destroy your business or your dreams of owning a business. Instead, it can provide you an opportunity to put the past behind you and start new—with better financial management. 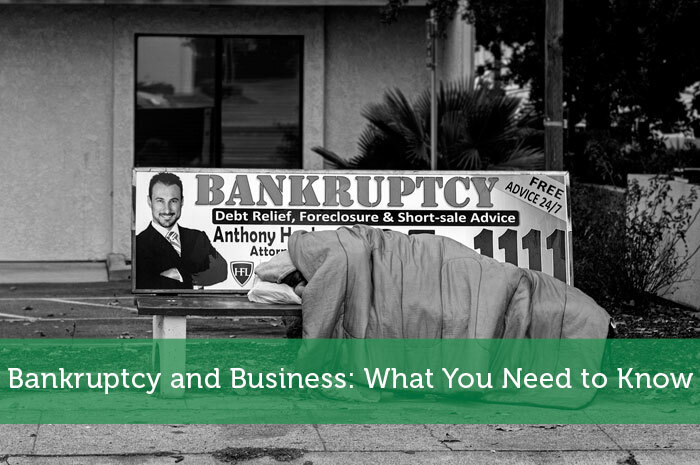 So if you’re considering filing your business for bankruptcy, here are a few things you first need to know. Filing for Chapter 7 bankruptcy is one option you have as a business owner. You can either file Chapter 7 for your business, or you may have to file for Chapter 7 personally, depending on if you are the sole propitiator of the business or not. With Chapter 7, the business’s trustee is placed in charge of selling off the company’s assets and paying its creditors. As the business owner, you can either opt to start another company, or go and work for someone else. There are downsides to Chapter 7 bankruptcy. The company will not receive a discharge of debts, and you cannot exempt certain assets from being included in the process. Instead, every asset the company has will be used to pay the company’s debts. Chapter 7 is the best alternative for business owners who are not personally liable for the company, for company’s that have little to no assets, or for owners who want to simply close the business down without considering starting over. Chapter 13 bankruptcy is the other popular option for businesses considering bankruptcy. One of the biggest differences is that only individuals can file for Chapter 13, which means that if your company is a partnership, LLC, or corporation, you will need to file for Chapter 7. If you are the sole propitiator, you can file for Chapter 13. One of the biggest advantages of Chapter 13 is that you get to keep all your assets. Instead of using assets to pay creditors, you are instead given a payment plan in order to repay any debts you and the business may have incurred. This allows you to keep the business running while you get your finances in order. One of the downsides to a Chapter 13 bankruptcy is that it takes much longer. Instead of having your debts paid off right away through assets, you are now spreading those payments out over three to five years. Chapter 13 also only eliminates the personal debt you had related to the business, not the company’s debts. This means that you may have to pay down your own personal debt while still finding money to pay the company’s debts too. If your company is doing that poorly financially, this may not be the best option. Also check out the difference between chapter 7 and chapter 11 bankruptcy. Bankruptcy is a terrible thing, it’s a very stressful process and because it’s not very common it can be difficult to find support. I haven’t been trough a personal bankruptcy myself and hopefully never will. Watching my own mother go through this process, I would not wish it on anyone. It really is a terrible process to watch, let alone, go through.